This week, as part of my Along the Way Interview Series, I’m talking to Julia Enthoven. 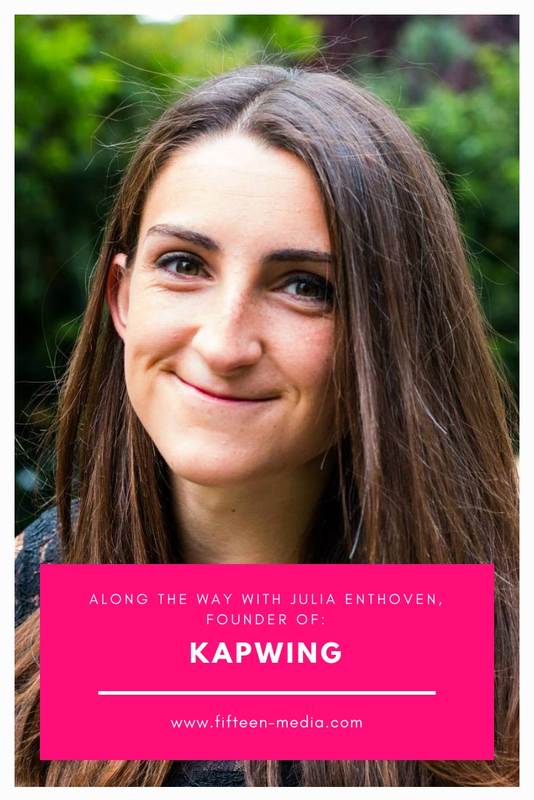 As the co-founder of Kapwing, an online video editing platform, Julia is making video editing easier and accessible to everyone. Today, she shares why she left her career at Google to join us in the ups and downs of entrepreneurship. Without further ado, let’s chat with Julia about how she pursues her vision. 1. Before entrepreneurship, what were you doing and how did you feel about it? I started Kapwing, an online video editing platform, last September. Before then, I was an Associate Product Manager (APM) at Google, first on the Identity and Authentication team then on the Image Search team. I learned a huge amount there about product development, design, and consumer internet trends, and I loved my job and the company. Before Google, I studied math and computer science at Stanford. 2. Google is consistently ranked as the #1 best place to work. What prompted you to leave and what were you looking for when you founded Kapwing? Google lives up to its reputation—I worked with incredibly talented people and launched some impactful projects. But it’s also an enormous company, and, after two years, I craved more ownership over my work. I wanted to be able to truly move the needle from zero to one rather than working on incremental improvements. I’ve always wanted to start my own company, and it seemed like great timing in the market to work on video creation software. When the opportunity came up to work with Eric (my cofounder), I felt like it was a good time to take the leap and try it out. 3. You have a co-founder, Eric Lu, can you tell us about why you chose to bring someone else in, how you knew he was the person to be your co-founder, and what clues should other entrepreneurs look for when considering a co-founder? I definitely could not have founded Kapwing by myself, and Eric would say the same thing. Our partnership has been essential to the company’s growth, both because we have complementary skills and because we lean on each other emotionally for support. Eric and I had worked together before at Google, and we were both impressed by each other. He’s scrappy, creative, and very action oriented, which makes him an excellent entrepreneur. He has a huge amount of conviction: the desire and self-confidence to start a company no matter what it takes. I knew that he had some of the skills I lacked (and vice versa), and that makes us a strong team. We were also friends beforehand so we knew we probably wouldn’t drive each other crazy. There have definitely been heated debates and conflict, but our mutual respect, appreciation for the other, and commitment to putting the company before our individual interests gets us through the tough days. When I meet aspiring entrepreneurs, my advice to them is to find a co-founder before they find an idea. Cofounders make the difficult startup journey—which is surprisingly lonely—easier and more fun. I wrote a blog article on finding a cofounder, but one piece of advice I’d highlight is to do a starter project with a potential cofounder. A short project helps surface potential issues or synergies before both of you commit. 4. As a woman engineer, woman in tech, woman founder and women CEO, can you talk about when your gender was an unnecessary challenge? And do you think there’s progress in Silicon Valley on this issue? In Silicon Valley, social/professional lives mix a lot. I think being a woman in tech is a disadvantage because it’s harder to get to know men socially (read my extended thoughts on this issue). That being said, despite my gender, I’ve had incredible access to exclusive communities like the Stanford alumni, Xooglers, KPCB portfolio, StartX neighborhoods, and others where I’ve gotten to know engineers, investors, advisors, and later-stage founders. I’ve benefited from organic friendships with powerful people in Silicon Valley that women often don’t have access to. Of course, for any person to be successful, they need to be treated with decency and professionalism. I’ve never been treated inappropriately at work, and I feel that Silicon Valley has made a lot of progress towards preventing violence, discrimination, and harassment in the last five years, although there’s still a lot of progress to be made. 5. On a lighter note, your software has been described as Adobe for meme generation. What is your favorite meme? I like the American Chopper meme! Hilarious to read the back and forths. 6. What part of your product can customers really see your heart and soul in? I’ve been sharing our journey of growing a startup on the Kapwing Blog. I feel there’s a lot of overblown advice out there about entrepreneurship out there, so I’ve tried to offer a more honest, practical perspective on our ups and downs. In terms of video features, my favorite is our Montage Maker. It’s fun to see the original stop motion videos and mashups that people make online, and I think there is a lot of headroom for improvement. 7. How is Kapwing making a difference in education? Video is an important medium in education—young people make, share, and consume a lot of video content because it’s engaging, informative, and memorable. Teachers know how stimulating video is and often make visuals to support their lessons. But making video in classrooms is still very difficult because the leading software doesn’t work on all devices and because the professional editors have a slow, steep learning curve. Because Kapwing is fast, simple, and works everywhere, it’s an important tool for teachers and students to make assignments, curriculum, study materials, portfolios, recordings, or funny memes to share with each other. Kapwing works on Chromebooks, the leading K12 computer, unlike many of our competitors. Kapwing was named one of the Best Websites of 2018 by the American Association of School Librarians and has been featured in many ed tech blogs. It’s used in thousands of schools everyday. We’re always looking for feedback from teachers, and educators can contact us to join the Kapwing K12 Pilot program . 8. How do you measure your success? What does success look like? And when will you feel that you’ve “Made It.”? I’ll never have “Made it”! I’m the kind of person who will be constantly looking for new challenges, adventures, and experiences. I actually find that the times in my life when I’m happiest are those when I’m working the hardest and being pushed the most. My next milestone for success is hiring one more engineer for Kapwing, then growing it to raise our series A as quickly as possible. 9. What distractions or doubts do you fall victim to? And how do you get back on course? In the early days, I had a lot of doubt about my vision for Kapwing. I think there’s a myth that founders have the plan all figured out from Day 1, and I definitely did not. I wasn’t sure how we would market, monetize or add virality to our online video editor. But dwelling on the risks and threats was unproductive. Now, I stay focused on the opportunities ahead of us instead of the ones we missed and our strengths instead of our weaknesses. 10. What would you tell someone who is considering leaving a tech job to start a tech company? Find a great co-founder! Also, learn about distribution and monetization. Many people who leave big companies have more experience with product development than the other aspects of growing a business and underinvest in sales, SEO, etc. Don’t be afraid to jump on the bottom of a new learning curve.